Lovingly maintained Single-Family Home with many updates. Spacious Living Room. Ceiling fans throughout home. Updated lighting inside home. Master bedroom with dual sinks, separate tub, shower and walk in closet. Large Second bedroom. Third Bedroom / office. Fresh exterior paint August 2017. Updated outdoor lighting 2017. Updated Tile floors and carpeted bedrooms . Flagstone path to back yard. 90% window screens SRP approved - It's cool inside!!!! 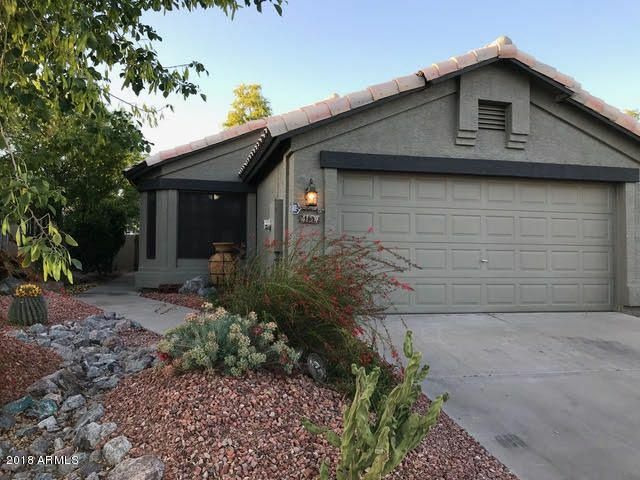 Roof, A/C and home inspected yearly since 2006 with home warranty Professionally landscaped low maintenance plant and rock front yard. Large back yard can accommodate a pool. Water with programmable drip system in front and back yards. Appliances Included. Updated garage with fans and shop lights for workshop, 220 plug.